Join the discussion on our forums! 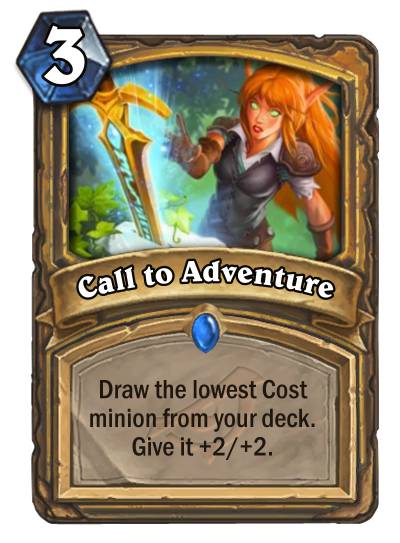 Come discuss Call to Adventure over in our dedicated Call to Adventure discussion topic. I kinda wanna see how this works with Meanstreet Marshal in wild! A way to find Hecklebot early. It's a tutor card. Therefore, this can't be bad. Maybe not now, but it will see play in some deck in the future. I suppose the best card to get is Immortal Prelate indeed, but is it good enough to make that deck good? I'm going to play it simply because the art looks cool. Absolutely busted in Arena as it turns your low-value minions into something better. In Standard... maybe? And in Wild, definitely playable. Is this a reference to the master sword from zelda games?